Discussion in 'The HCRU Family Photo Album - Say Cheese.' started by HERMEZ, Oct 27, 2009. Wow! They look great! Where do you get Violas? I can only find PPs. Why are they difficult? I've had some hard ones that tear the tank to shreds . Oohhh---Ahhh...NOW I can see them! I left my reading glasses home and I couldn't tell if they were green, orange, or canary yellow, or none of the above. Like your new decoration---what's de crabbies think of it? How cute!!!!!!!!!!! !Wish i could have more crabs. because I plan on getting new crabs. Who knew crab equpment could be sooo expensive. I'm now trying to be more thrifty in my shopping. McKenny needs to post her E's hmmmmmmmmmm? When I find them! Little buggers are as fast as I don't know what! Congratulations!!! They are so pretty! I love that decoration, too! I have a similar one, except it's two palm trees without the hemp rope. How cute!!!! I love violas, i want some so bad! (mainly because of their origin, but they ARE killer cute!) 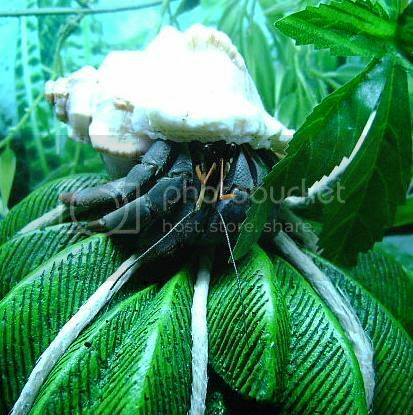 Do you keep them in a tank with another hermit species, or can you not do that? OH I never find out. Most of mine are shy but maybe you could hold up a piece of plexiglas and look at them from underneath. I think they are the cutest!I want some!!!!!!!!!!!! !